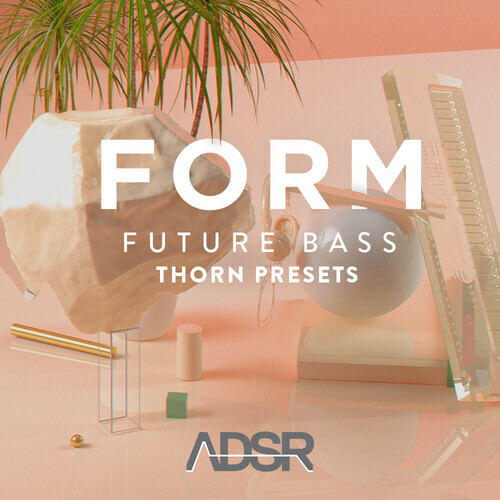 Over the holidays the ADSR team hit the studio to delve deep into one of the most popular synths on the ADSR store, Thorn, to create a unique set of presets for Future Bass & Future Pop. Form Future Bass is an eclectic spin into Future Bass utilizing Thorn’s Spectral Synthesis methods, FM synthesis and Harmonic Shaping. The result? Super lush evolving pads, futuristic leads, harmonic bass tones and spaced out inspiring keys. Add in your own touch by experimenting with Thorn’s Harmonic Filter and you’ve instantly morphed one sound into something unique. 50 presets for Thorn have been included along with 18 custom noise tables. These presets can be used for a variety of musical genres such as Future Bass, Future Pop, Deep House, OVO styled R&B / Hip Hop, Chillout & Experimental Electronica. Please Note: The drums used for the creation of the audio demo song are not available in the pack. Some of these drums and percussion parts are from ADSR’s FVTVRE Bass Trap & RnB and ADSR’s Purple Pads – Future Bass / RNB / Lo-Fi Chill.